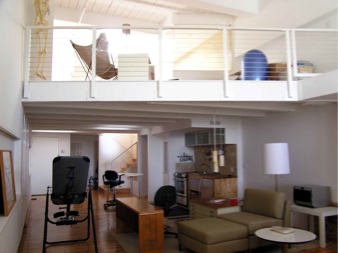 We entirely renovated this loft space in a building that had previously been a tobacco warehouse. It is a long narrow space, with a large bank of southeast facing windows and a single skylight. The existing space was very dark - we entirely opened up the design to allow the daylight to reach all corners. The second floor structural and finished floor was salvaged from a recently demolished warehouse, and we inserted translucent polycarbonate panels to allow the daylight to pass through to the first floor.